How do I stop an email alert? This article is meant to assist you with the extendedReach Email Alerts. Email Alerts are pre-planned email messages created within the extendedReach system announcing either an “Action-Based” Event or a “Scheduled” Event within cases and homes. “Action-Based” events include workflow related user actions, such as approvals. “Scheduled” events include specific dates such as birthdays or court dates. You must be an Agency Administrator to access “Administration” on the left side of your Workspace. Go to “System Settings” and click on “Email Alerts”. 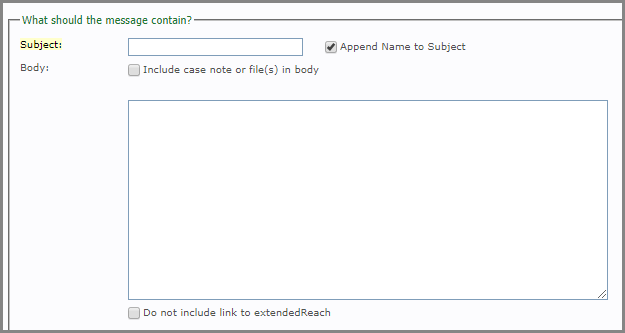 When adding an Email Alert, extendedReach will apply your criteria to all cases in your agency by finding the best match. Within Email Alerts, click on “Add Email Alert”. Alert Name: Alert Name is the title under which this alert is stored. This name will auto-fill your “Subject” line in “What should the message contain?” found below. Alert Status: Indicates whether the alert is active or not. Agency (if applicable): A pull-down menu will be available if you have multiple agencies. Alert Type: You will indicate whether this alert is for a case or staff. 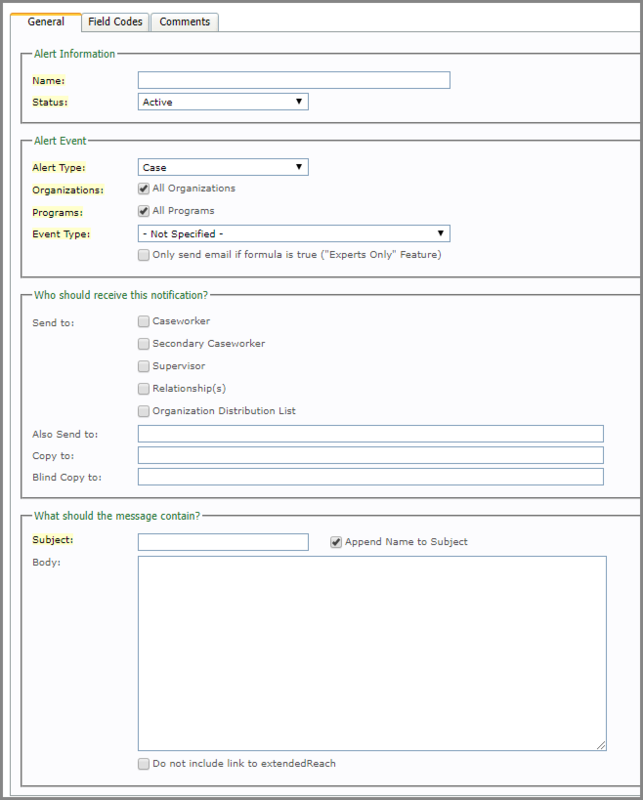 Organizations: Select which organizations the email alert will be used in. Programs: Select what programs within cases. Event Type: Select the event type from the drop-down menu. 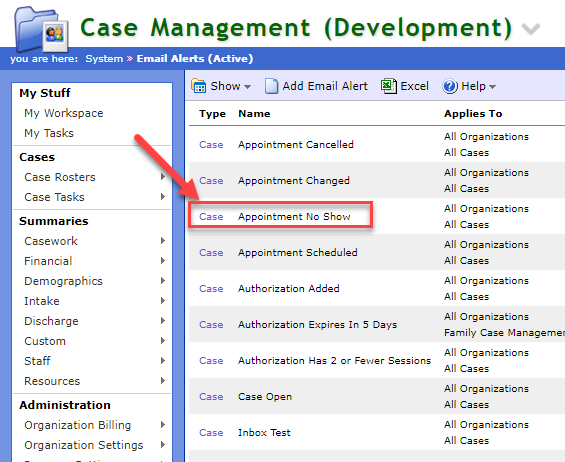 When an event type such as Case Activity Submit, Case Report Complete, Case Activity Approve, etc. 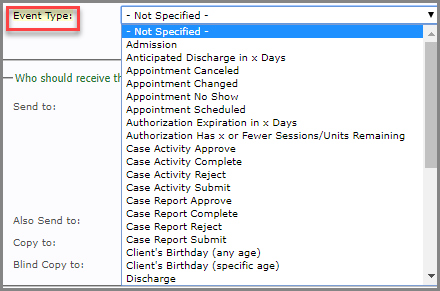 are selected for the Event Type, an additional field will appear under it. This field will be called Activity Type(s) or Report Type(s) depending on the Event Type that was chosen. 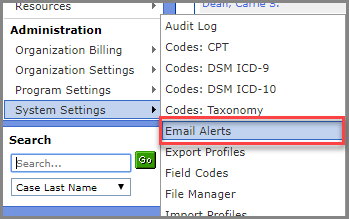 Enter in the exact name of the activity or report that should be associated with the email alert. If that field is left blank, it will send out email alerts for all reports/activities. Send to: Select to whom you want this email notification sent. Also Send to: You can add additional email address(es) with commas between each address to this email notification. Copy to: You can carbon copy additional email address(es) with commas between each address to this email notification. Blind Copy to: You can blind carbon copy additional email address(es) with commas between each address to this email notification. Subject: This email title or “Subject”, is auto-filled with “Alert Name” from the above “Alert Name” in “Alert Information”, and can be modified. Append Name to Subject: Checking this box will add the client’s name to the subject field for your email alert. Body: Additional information can be added to the body of the email notification. Do not include link to extendedReach: The eR weblink is included in each email notification. If you check this box the link will NOT be included in the email alert. Be sure to let receiver outside of eR an email will arrive from alerts@extendedreach.com. Email Alert will be open. Select “Edit” to make changes to the alert, or “Delete” to remove the alert entirely. You can also select “Inactive” as the “Alert Status” under “Alert Information” at the top of the screen, if you wish to refrain from sending this alert, but plan to use it again at a later date. Be sure to save your edits.